There are certain items that you simply need to have when you’re going to be camping out in the wilderness, and they include a GPS, compass for navigation and a clock for telling the time. A watch is one of the most ubiquitous item hunters should have when they’re out in the wilderness. They are designed to outlast whatever the wilderness throws at them. This article will cover the most versatile and top camping watches on the market today and then go over the different qualities to look for in a camping watch. If you ask any dealer in watch products, you will always hear that saving your money requires you to make wise selections before you carry out the actual purchase. It is essential to check whether a watch water resistant as this can guarantee you helpful service as well as the likelihood of the watching staying for a longer period since emergencies is always a common phenomenon. The other thing which is of equal importance as the first factor concerning the watches is the shelf life of your watch’s battery. A majority of watches in the market today have serious battery-related issues which imply that the longevity is entirely questionable. Thus, to safeguard your money, you need to do a thorough check on the watch battery to determine whether it can be recharged, whether it can be replaced as well as whether its current status is functional. Apart from the factors as mentioned earlier, it is essential to ensure that the watch is in a good state at the time of purchasing and also check whether the clock is functioning as appropriately as expected. These factors will prove worthwhile in saving your hard earned cash. When it comes to men’s classy look, look no further that the Casio PRW 2500-1A PROTREK Watch which features as one of the latest trends to enter the market. You may ask why Casio PRW 2500-1A PROTREK Watch? But the simple answer to this is that is one of the high-performance tools which is the latest development that takes into consideration the meteorological concerns thus you can know quite well the how challenging environments change. The original attractive features which make this watch to stand out include the presence of the barometer, compass direction as well as the thermometer. In addition to these exciting features, you are likely to encounter a one-touch experience, a triple sensor and a duplex LCD layout which together assures you of information at a glance. Ultimately is also water resistant. These enable you to experience fun during fishing, sea kayaking river rafting as well as trekking. In general, this model has proved to be the best since it provides opportunities and represents an excellent way to help you along your journey in the wilderness. As a result, the features of this watch ideally position it on top in the market for buyers. We, therefore, recommend to you without hesitation. Ever wondered why watches vary in prices yet they seem to have similar structures as well as physical appearances? Then it is time to worry no more. 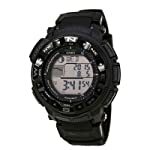 This Casio Men’s GW-9400BJ-1JF G-Shock Master Range-man brand of a watch has all that you need concerning complexity. The product is solar powered, multiband radio-controlled. In addition to the ABC applications which are the altimeter, barometer and compass direction combination, it is evident that its compass is a digital networked search engine with stronger navigation capabilities than similar brands. Besides, it is an imported product featuring Japan as the primary source. Moreover, the Casio Men’s GW-9400BJ-1JF G-Shock Master Range-man Watch is an excellently-looking one when it is worn with the highest levels of ABC accuracy and two-dimensional displays i.e. negative and positive. Therefore overall speaking, it is a supposedly a must purchase for all gentlemen. The attached guidance manual is done in Japanese hence the need for a new online download for a language which you are conversant. Considering the features mentioned above, we consider this model being the best. Most people are impressed at how rugged and stable this watch is. Hunters find this watch reliable and have no concern about its functionality. Are you looking for further advancement in watch properties? Look no further than the Suunto Core Elastomer SS014279010 Watch. The ABC properties work in a simultaneous manner for this watch giving you a smart experience. The Suunto Watch can track the weather changes as well as the sun for your benefit. Besides the weather trend graph enables you to be aware of the sunrise/sunset conditions for more than 400 locations thus preparing you for the probability of an impending storm. The display of elevation points, as well as the previous day’s conditions, is other exceptional benefits that can be derived from this outstanding product. Ultimately, apart from the abovementioned characteristics, it is important to note that the Suunto Core Elastomer SS014279010 Watch is compatible with different watch straps and it comes in a variety of colors ranging from black, aluminum black, light black, light green, aluminum Brown among many others depending on your color preferences. Thus in you been dying for these properties that fit your outdoor activities, this is the perfect stop for you. The ultimate black model does not include the distinctions of degree adjustments around the bezel. This model is the best for hiking and camping trips. The watch is very durable, and all the features work as advertised. Therefore, the watch shows notifications from the phone when paired via Bluetooth. 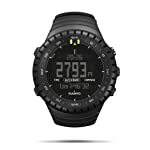 Among our 3 products, we pick Suunto Core Digital Dial Composite Elastomer Watch as a great choice for hikers as well as mountaineers as it offers excellent functionality and durability. Additionally, it does not only offer many useful features but also looks very fresh and stylish. Therefore, all the features work as expected. Considering the fact that a high-quality watch is quite expensive, you’ll need to spend some time doing research. The best camping watches are equipped with features that make them suitable. We hope that our reviews help, but if you can test personal observations before you commit to purchase, this would be fantastic. How To Find The Best Night Sights M&P Shield 2019?